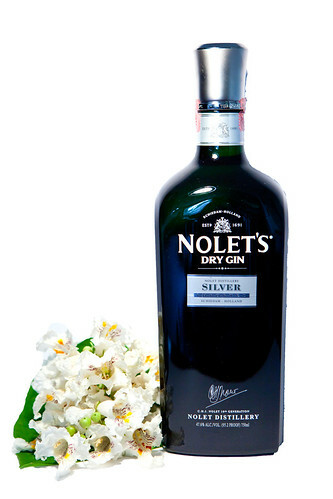 I was intrigued with Nolet’s Silver Dry Gin, as I was searching for very good gin for refreshing summer cocktails. Have you read through NY Times’ summer cocktail article published earlier this week? It made me thirsty. The Nolet family is best known for Ketel One Vodka (introduced by Carolus Nolet Sr. in 1983), their distilling tradition goes back over 300 years. The Nolets were previously famous for their gin, including the production of Ketel 1 Jenever for the Dutch market. The Nolet’s Silver and Reserve gins are distilled in copper pot stills and bottled at the Nolet Distillery in Schiedam, Holland. Founded in 1691, the distillery survived the French Revolution and two World Wars, and has been exporting spirits to the United States since the late 19th century. Nolet’s Silver Dry Gin is 95.2 proof (47.6% ABV) retails around $49.99 (750ml) bottle. When inhaling its scent, the aroma is sweet and fragrant with rose, lavender, and fruit. It had hints of peach, raspberry, citrus and a hint of juniper to the taste with a warm, long and velvety smooth finish. It’s a damn fine gin. The Nolet’s Silver Dry Gin is currently available in limited release in California, Florida, Illinois, Massachusetts, Nevada and New York.